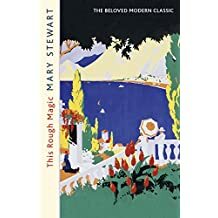 Enjoy Corfu: This Rough Magic by Stewart – Joyce's mystery and fiction book reviews with some non-fiction too! I happily read all of the books by Mary Stewart when I was younger. My mom had some of them at hand. They were always enjoyable reads. As is the case with This Rough Magic, the books always had intelligent heroines, interesting settings, mystery and romance. This one features Lucy, an out of work actress, who spends time with her sister on Corfu. There are death, accident and adventure in this story. Who is Godfrey and what is he doing on Corfu? Why is an older actor holed up there and what is his son doing on the island? With a cast of both local and visiting characters, this is a good read for those who would like a bit of escape. Wonderful author! Loved her mystery novels and later was besotted with The Crystal Cave aka Merlin Chronicles series. I also enjoyed The Crystal Cave. In the Arthurian vein, I also like The Once and Future King and The Mists of Avalon. Have you read those? I’ve read The Once and Future King but I can’t recall The Mists of Avalon. I will seek it out! Wishing you a lovely literary New Year, Joyce, and happy reading. Thank you! The very same to you. The Mists is told from the women’s point of view.